Hi I finally managed to get to try my new to me saddle bought online. Was sold to me as a wide tree. I even had my first ride of year in it. 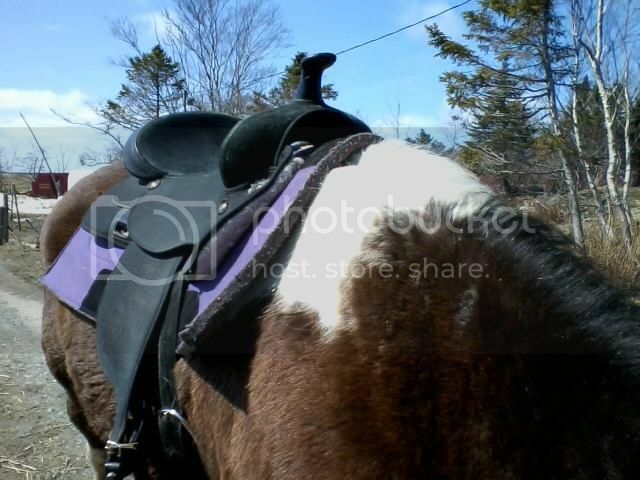 Horse it is on is a Percheron/Paint/QH cross who has a bit of a wither IMO. Not sure if the photos are any good to tell the fit or not. Don't really know how to take good photos with a cell phone. First photo is after ride. Second is also after ride. at first it seemed like there was lots of wither clearance but at end of ride I couldn't quite get a finger between the fork and the wither. and also suspect there is no clearance over the spine when mounted. Can anybody tell anything from my photos? I rode in an OLD semi qh wintec today and the horse moved out extremely well, plus I could fit a finger between the spine and the ground seat of the saddle. One would think this might mean a better fit perhaps? I think the saddle will probably be ok. I think you just need a thicker pad under it. Try adding another pad on top of that one, or if you have a thicker pad try it. Google Ted Sloan Saddle Pads. This is the type of pad Ed uses on Hookie. It conforms to his back and the extra thickness takes up the extra space in the front. I will try a different pad to see if it makes a difference. This purple one is brand new. thanks. One thing I noticed in the pix is that the pad/blanket is flat across the withers. I always make it a point to push the blanket/pad up under the pommel so that the saddle doesn't compress it down on the withers when there is weight in the saddle. Does that make any sense? I try to do that too, AD...and more often than not, the pad works its way down onto the withers, anyway. 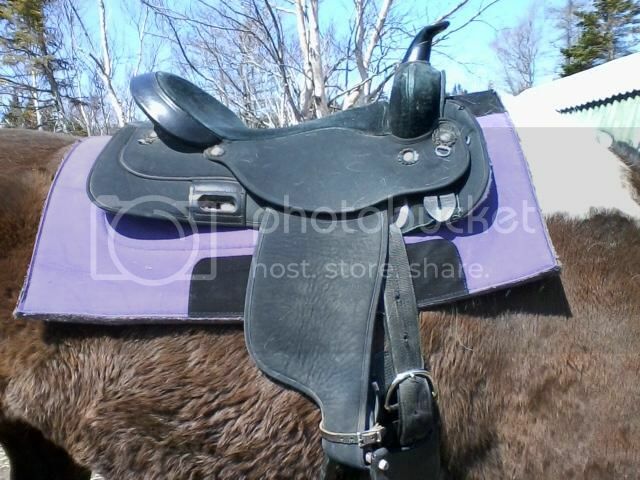 I got frustrated with that, and drilled a hole through the top of the pad, threaded a saddle string through the hole, and looped it over the saddle horn to keep the pad off the withers. Looks funny, but it works. I don't know why I have this problem. Seems like most people can pull the pad up, and it will stay up. Nearly ruined my drill, though! Let's just say they are not typically used to drill through felt. If anyone wants to try this, it might make more sense to have a loop or something sewn onto the pad to run the saddle string through.